MORE than 50 more staff — mostly in claims and customer service — have been recruited at esure’s Glasgow site in a three-year drive to nearly double the number there. The growth is mainly due to the rise of price comparison sites, said a spokesman. Previously, potential customers would seek quotes from just three or four well-known companies. Now, they could search the market and see esure’s offerings. Companies pay a fixed price per referral from such sites. He pointed out that although the majority of policies were sold online, administration was mostly by telephone. More floor area has been opened in the eight-storey glass-fronted building, The Equinox, to house the new employees, aided by a £1m grant from the Scottish government. Esure is a joint venture between the Peter Wood and Lloyds Banking Group (then its subsidiary, HBOS). The new staff join 600 in Glasgow; another 300 are divided between Manchester and the company’s HQ in Reigate. The company’s brands include Sheila’s Wheels and it handles car insurance for HBOS and Sainsbury’s. 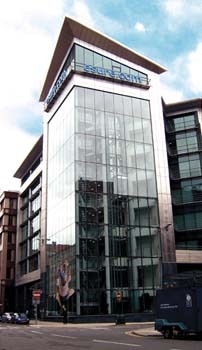 Its Glasgow building is opposite Direct Line, founded by Mr Wood with backing from the Royal Bank of Scotland. Mr Wood became a millionaire several times over when RBS bought out his contract.